The building is energy neutral, LPL says, and will offer free electric car charging and recycle most of its water. LPL's new energy efficient headquarters in San Diego. LPL Financial (LPLA) opened its new San Diego headquarters, Tower II at La Jolla Commons, on Wednesday. The independent broker-dealer — which also has headquarters in Boston and Charlotte, N.C. — says the structure is one of the largest net-zero energy commercial office buildings in the United States. 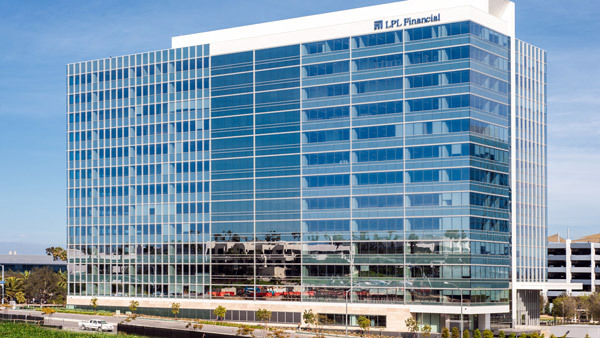 About 1,600 LPL Financial employees, who previously worked in seven office buildings in the La Jolla area of San Diego, are now based in the new 13-story facility. “At LPL Financial, we are ambitiously working to be an employer of choice. As part of this commitment, we knew that our work environment needed to make an investment both in our employees and in the San Diego community,” said LPL Chairman and CEO Mark Casady, in a press release. The tower has three fuel cells to convert biogas into carbon-neutral electricity. Energy meters are located throughout the building, and surplus power is pushed back to the grid through San Diego Gas & Electric, according to the IBD. In addition, the tower has LED lights that automatically dim based on available natural light and sensors that turn lights off by detecting unoccupied offices. In addition, 88% of the tower’s water consumption, estimated at nearly 2.5 million gallons a year, is set to be recycled and used for irrigation and other building needs. On-site charging stations for electric vehicles are also available for employee use at no cost. In addition, Tower II at La Jolla Commons also has an on-site health and fitness center with a certified wellness manager and a cafeteria featuring healthy food options. LPL Financial serves more than 13,600 independent financial advisors, 4,500 licensed insurance agents and some 700 financial institutions. It has a total of roughly 3,000 employees in San Diego, Boston and Charlotte. During a call with equity analysts in February, Casady explained that the independent broker-dealer is no longer pursuing any plans to form a bank holding company. It is, however, still considering the possibility of acquiring an industrial loan company. Its stock is up about 13% so far this year, way ahead of the major equity market indexes.